Alphabet Inc. (commonly known as Alphabet) is an American multinational conglomerate created in 2015 as the parent company of Google and several other companies previously owned by or tied to Google. The company is based in California and headed by Google's co-founders, Larry Page and Sergey Brin, with Page serving as CEO and Brin as President. The reorganization of Google into Alphabet was completed on October 2, 2015. Alphabet's portfolio encompasses several industries, including technology, life sciences, investment capital, and research. Some of its subsidiaries include Google, Calico, Google Ventures, Google Capital, Google X, and Nest Labs. Following the restructuring Page became CEO of Alphabet while Sundar Pichai took his position as CEO of Google. Shares of Google's stock have been converted into Alphabet stock, which trade under Google's former ticker symbols of "GOOG" and "GOOGL". On August 10, 2015, Google Inc. announced plans to create a new public holding company, Alphabet Inc. Google CEO Larry Page made this announcement in a blog post on Google's official blog. Alphabet will be created to restructure Google by moving subsidiaries from Google to Alphabet, narrowing Google's scope. The company will consist of Google, Nest Labs, and Calico, as well as other businesses including Google X, Google Capital, and Google Ventures. Sundar Pichai, current Product Chief, is to become the new CEO of Google, replacing Larry Page. Alphabet is mostly a collection of companies. The largest of which, of course, is Google. This newer Google is a bit slimmed down, with the companies that are pretty far afield of our main internet products contained in Alphabet instead. […] Fundamentally, we believe this allows us more management scale, as we can run things independently that aren’t very related. Page says the motivation behind the reorganization is to make Google "cleaner and more accountable." He also said he wanted to improve "the transparency and oversight of what we’re doing," and to allow greater control of unrelated companies. 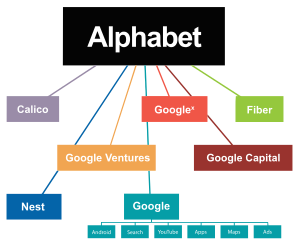 Alphabet's largest subsidiary is Google Inc., but Alphabet is also the parent company to Calico, Google Ventures, Google Capital, Google X, Google Fiber, and Nest Labs. While many companies or divisions formerly a part of Google became subsidiaries of Alphabet, Google remains the umbrella company for Alphabet's Internet-related businesses. These include many of the most iconic products and services long associated with Google, such as the Android mobile operating system, YouTube, and Google Search, which remain direct components of Google Inc. and were not made subsidiaries of Alphabet.